“Here You Come Again” is a song written by Barry Mann and Cynthia Weil, and recorded by American entertainer Dolly Parton, which topped the U.S. country singles chart for five weeks, and won the 1979 Grammy award for Best Female Country Vocal Performance; it also reached number three on the U.S. Billboard Hot 100, representing Parton’s first significant pop crossover hit. 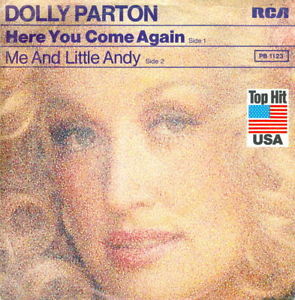 “Here You Come Again” was released as a single in September 1977 as the title track from Parton’s album Here You Come Again, and was the centerpiece of her now famous pop crossover move in the late-1970s. The recording spent five weeks at the top of the U.S Billboard country charts and earned Parton the award for best female country vocal at the Grammy Awards of 1979.